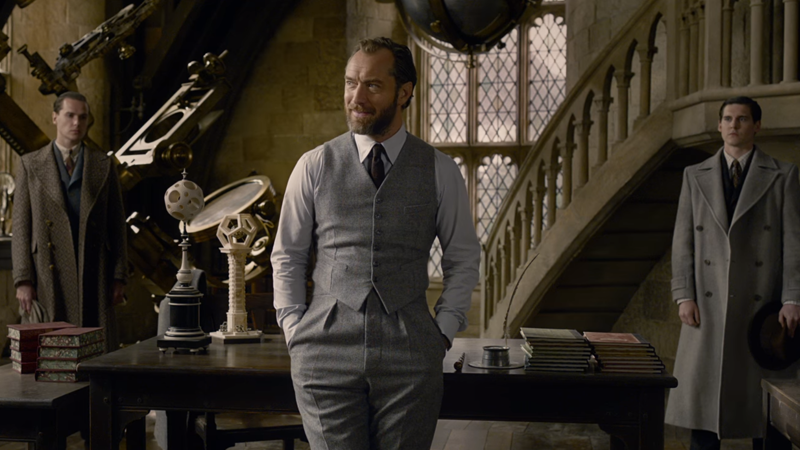 Jude Law as the dapper Albus “Young Dumbledore” Dumbledore in The Crimes of Grindelwald. The Fantastic Beasts sequel is diving into the past of one of the Wizarding World’s biggest non-Voldemort bads: Gellert Grindelwald, who has a deep history with another titanic presence in the series, Albus Dumbledore. And yet, according to Jude Law, neither character will actually directly interact in the film. I don’t actually have any scenes with Johnny. As I said before, this is only Part 2 of a longer story. I’ve always admired him from afar, but we don’t know each other, and I’ve not yet met him on this. In many ways that suits the relationship as it’s been many years since they’ve seen each other. So there’s complexity in that that’s fun to mine. Again, the past will reveal itself. While it sounds like an inevitability that Dumbledore and Grindelwald will cross paths with each other in future Beasts films, given the huge and intense history between the characters it seems odd that there’s no actual interaction between them in this film. It also means that, to the surprise of no one, the film gets to conveniently glide over the fact that Dumbledore and Grindelwald’s history is also a shared romantic past, another source of controversy among fans. Fantastic Beasts: The Crimes of Grindelwald is set to release November 16, but Potter fans will have to wait quite a bit longer to see the sparks fly between Dumbledore and Grindelwald on screen. What's Jude Law's Better Young Role, Young Dumbledore or Young Pope?